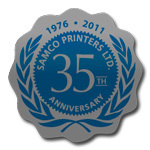 Samco Printers is an award winning printer committed to excellence in printing. We take pride in our craft and the awards are proof of our capabilities and dedication. Here is a list of awards we’ve received recently. A note to thank you for the excellent printing job you did on our Senior Executives Forum program. Not only professional typesetting; but the only error found was mine. It is seldom these days that one comes across a company which consistently produces the high quality service or product expected of them. As a client, I cannot tell you how satisfying it is to deal with an organization which manages to keep its good people from year to year. Samco is indeed fortunate to have a group of people who are so very attentive to details. I would like to add that I have never been involved with a company that sets such high standards of quality in their product and this was a truly refreshing experience. I’m sure this will pay off in the long run as the Samco reputation for friendly, courteous staff and only the finest quality work becomes known throughout the business community. It is my great pleasure to commend you, and your firm, for your outstanding work in producing the official souvenir program for our event. Everyone who received a copy of the program commented on the “elegance and professionalism” of the job, including artwork, layout and reproduction. I thought I would take this opportunity to let you know how pleased we all are with not only the beautiful work that you and your company produced, as is evident by this letterhead, but also the care and attention that you and your staff gave to our particular business needs… we will never hesitate to recommend Samco Printers to anyone requiring services in the printing and graphics business. I especially want to thank you for suggesting the move from standard black-and-white to four-colour process for our bulk flyers. The full colour, two-sided flyers you produced were strikingly eye-catching, polished and professional, and I received many very positive comments from both vendors and customers alike. Recently, I was applauded for the handling and completing of three jobs. It may not seem much, considering my department pushes through dozens of projects and promotions a month; but these were special. They all demanded a quick turn around at a reasonable price and with quality productions. 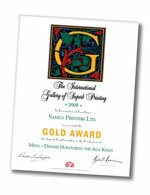 I met the criteria because Samco Printers Limited did the work for me. The brochure is nothing short of superb. It is an eye-catcher that conveys our message of leadership and excellence from the moment one picks it up. It demands attention and that’s just what we want and need. Thanks again, Sam, for your unstinting help in making this valuable program a success. All of the printing jobs that we sent to you were completed with pride and professionalism. The quality of your work is something that you and your staff can be very proud of. I won’t hesitate in recommending your company to my associates as their printing needs arise. Jonathan’s consummate professionalism and easy going personality created a very productive environment for the creation of my logo, stationery, referral pads and business cards. His patience in answering all my questions, and there were many, demonstrated to me the high level of quality and customer service that Samco represents. Please convey my thanks to Innis. It was a pleasure to work with him. He was very professional, friendly and patient. Even though we were on a tight schedule, his positive attitude and calm demeanour put me immediately at ease and I knew I had nothing to worry about. Omigosh, what can we say?! Thank you, thank you and thank you. You are our hero again, Sam! The professional expertise of your staff enabled us to produce both a beautiful invitation and an elegant program for the evening. Just a brief note to thank you personally for the recent printing of our business cards and official tax receipts. The quality of the cards is exceptional – they truly look magnificent – and the timeframe in which you produced them was extraordinary to say the least. How can I express to you my gratitude of the miracles in printing that you have performed on behalf of the S.P.C.A.? Your creativity and expertise most certainly added to the exquisite look and professionalism of the posters and invitations. The quality of workmanship certainly did not indicate a “rush” job. I was particularly impressed with the souvenir program. Your firm’s artwork, typesetting and reproduction, resulted in a program which is the finest of its type I have ever seen. The highly impressive quality work you produce in printing our programs and letterheads contributes substantially to the success of the event. The printing of our posters and programmes looked fantastic! Our event would not have made such a large impact without your assistance. Samco was the only one that could deliver a full 10 foot booth display by day’s end. Samco not only delivered on time, but did a great job and it’s better than the one we originally had. Polytek 360 Inc. and Pothole Busters Inc.